Oh gods! Haribon did not tell me to do this, I promise! It’s just I didn’t have anything else to write and this seemed like fertile material. On the other hand, since this is what I’ll be discussing, let me take this opportunity to pimp out our fun run. Last week, somebody at work convinced me to draw a few pictures for the Million Hectare Challenge ads. And before you say anything about the grave error in their part for asking me – somebody who is not a professional artist – to do it, they did intend to get amateur and home-made drawings from Haribon Members, so that’s ok. Anyways, I was asked to draw three wildlife species for the ads. I sometimes geek out on a particular project and devote a lot of effort into it for no reason in particular, other than the satisfaction of obsessing over something. That is definitely what happened here, and so I figured I might as well show the pics. 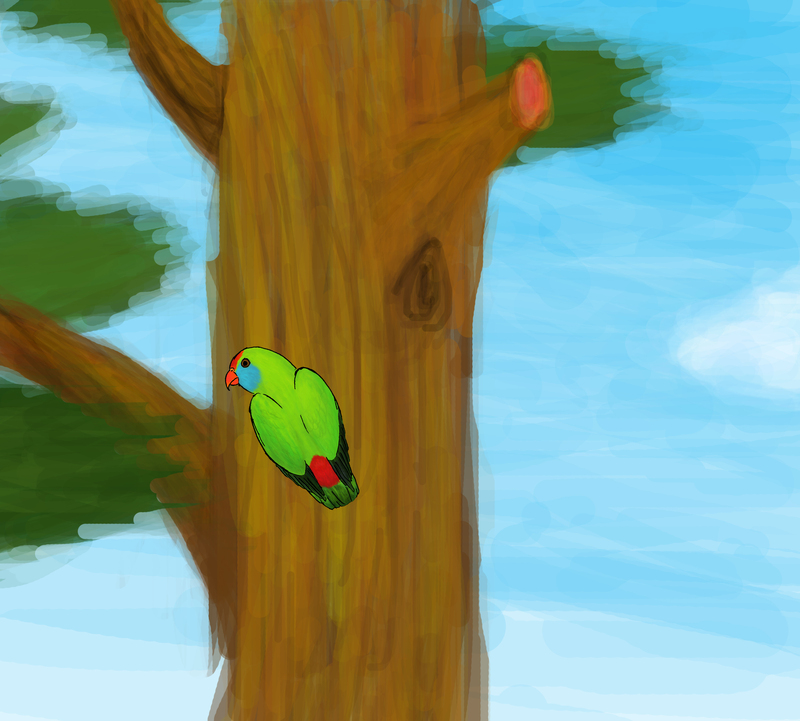 The first one is of the Philippine Hanging Parrot, also known as Colasisi (as in the poem-games of the olden times for the Bisaya). Loriculus philippensis is a small parrot endemic to the Philippines (surprise, surprise) and it lives in forest areas. It’s quite common, actually. I’ve seen more than a few in the many birdwatching trips that I’ve been in, and I’ve seen many being caged as pets in houses and illegal vendor’s stores. My right wrist was really aching by the end of drawing this one, and this was only the first of three. I don’t own a digital pen-thingy, so I had make do with a mouse. It was quite fun though, and I’m glad of how it turned out since this was my first time to paint anything remotely realistic. You will note that the background suffers from lack of detail, something that is common for all three drawings. That’s because I get tired after having drawn the subjects themselves and just went “oh to hell with it…” and did a few strokes for the scenery. Share book reviews and ratings with Kevin , and even join a book club on Goodreads.